The pensive Sven - the foreign everyman - wants only to be left alone in the park to enjoy his deep, meaningful inner monologue. Unfortunately, he is frustrated by a host of foreign movie icons, including suicidal clowns, militant mimes, and a playful Death. The story begins when a mime runs into Sven at the park, and gives him an "invisible box." Sven dismisses him rudely as a pretentious performance artist until - blasphemy! - the mime speaks. He shoves the "box" into Sven's hands and runs away. Later, the mime returns to Sven's apartment to retrieve the invisible box. 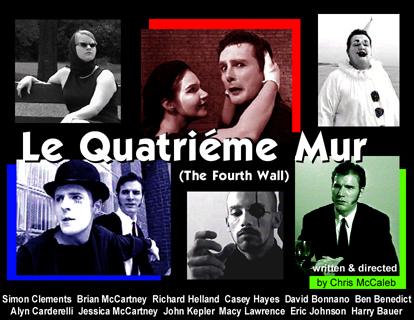 He tells Sven that he is a part of a mime resistance organization called "the Fourth Wall" that is fighting for the right to speak. His job is to take the box and its mysterious contents to the resistance leaders. But before he can, he is gunned down by a mime assassin's invisible, silent bullet. Sven is then embroiled in the resistance between the Fourth Wall and those that would keep them silent, as well as the eternal mime / clown conflict - until Death himself, who has picked Sven as his favorite game opponent, takes them all to the Other Side.